There’s one thing we know for sure: a great-fitting pair of jeans belong in every girl’s wardrobe! Rocking an apple shaped frame? Your perfect pair is out there, and we’ve got all the deets to help you find them. Read on for the best jeans for your apple shape. Like wearing your jeans full length? Not a problem! Just make sure they don’t bag at the ankle/foot, as this shortens your frame. Boyfriend jeans are a tried-and-true silhouette that looks good on everyone. Plus, the relaxed fit through the hip and thigh makes them oh-so comfy! 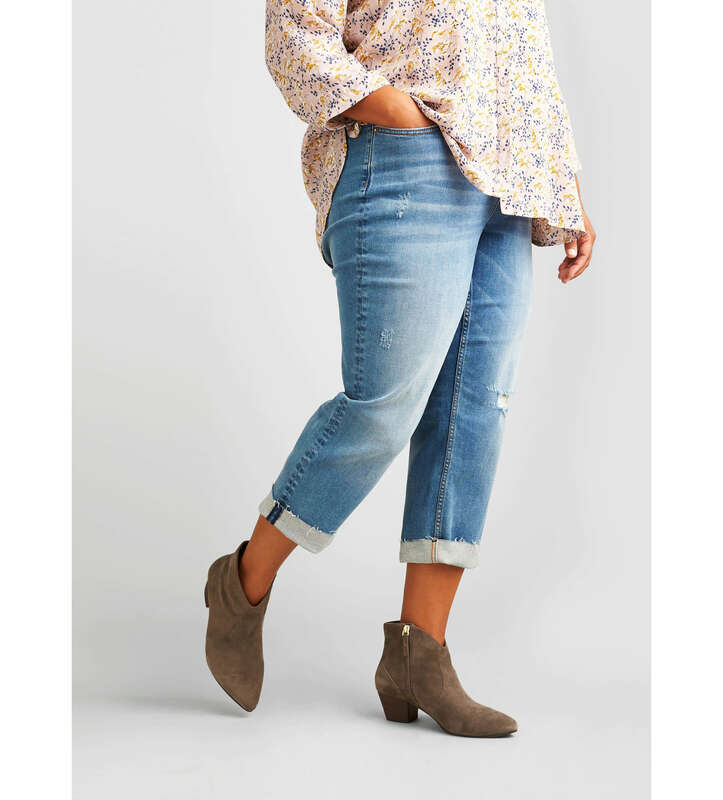 Choose a boyfriend jean that cuts a little slimmer in the leg–affectionately known as girlfriend jeans. They will still give you a loose, comfortable fit without concealing your leg line. Stylist Tip: Balance out a relaxed fit with something a little more fitted up top. Apple shapes look amazing in a v-neck top as they narrow the shoulders and draw the eye upwards. A bootcut jean or pant is another great choice for an apple shape, as the slight flare at the bottom balances out a wider upper body. Again, the inseam is key for elongating—your jeans should hit right at the floor to create a fluid, lengthening line. Select a mid-rise to keep you looking long and lean as it will hit your waistline at the perfect spot to avoid muffin top. A low rise can enhance a muffin top and shorten the look of your legline, while a high rise can disguise your waistline. The higher the cotton content in your denim, the higher the possibility that they will stretch out with wear. Denim that contains a spandex, lycra or poly blend is ideal for an apple shape. These blends help your denim hug your curves in all the right places without stretching out for the perfect fit every time you wear them. Denim washes are key to finding the perfect pair of jeans. Dark denim will be your best bet as it highlights your legs and narrows your hip and waist. Steer clear from whiskering which will widen your hips. If you love distressed features, keep them at the knees and ankles for the most flattering look. Need a new pair of jeans? We’d love to send some your way.